A woman receives seven letters from a former boyfriend, each one revealing highly diverse aspects of his personality. 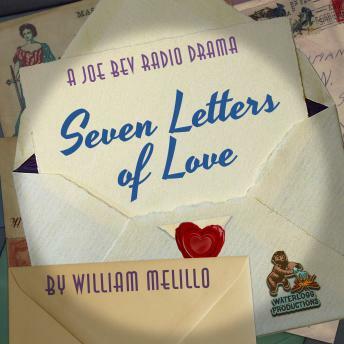 This unique radio drama was written by William Melillo and produced and directed by Joe Bevilacqua. Since 1980, Bevilacqua has produced many award-winning radio programs for National Public Radio, Sirius XM Radio and others. Not content to hide behind his microphone, Bevilacqua will be seen acting in the upcoming feature films: 'The Green Blade Rises' directed by A.J. Edwards, 'The Fly Room' directed by Alexis Gambis, 'Cold in July' directed by Jim Mickle, and 'Hits' directed by David Cross. Bevilacqua is the 2013 recipient of the Kean University Distinguished Alumni Award. His documentary 'Lady Bird Johnson Legacy of a First Lady' won the 2001 New York Festivals Award. He won a 2007 New York Festivals Awards for his 'Tribute to Joe Barbera' which aired on NPR's All Things Considered. And his NPR Weekend Edition story 'A Guy Named Joe Bevilacqua' won the 2004 National Federation of Community Broadcasters Award.